In our previous post on this subject we briefly looked at how we can use the detailed design information of bearings and gearboxes to look for specific fault conditions by collecting vibration information and analysing their frequency spectra. 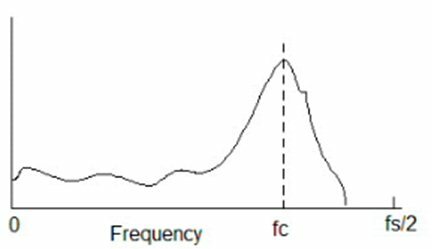 Amplitude modulation of the vibration signatures is common and we have seen how this causes side-bands to be present in the frequency domain. 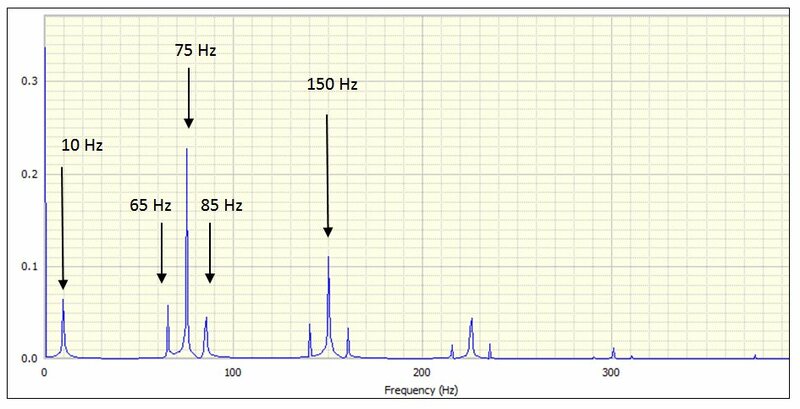 Understanding that modulation of primary fault frequencies may occur when analysing vibration spectra from bearings and gearboxes is important when diagnosing faults. However, sometimes these effects may be difficult to see if there are strong periodic signals present due to other components or if there is high noise content. One method often used to identify these fault frequencies and their side-bands is by performing envelope analysis. As its name suggests, envelope analysis attempts to determine the overall extremities of a signal. In analogue terms this may be performed by a simple diode to provide rectification and a low-pass filter. For digital signals there are a number of methods such as squaring the signal, to provide the rectification followed by a low-pass filter and then square-rooting. Another method utilises the Hilbert transform which is used to compute a complex signal from the real time signature where the imaginary component is a phase-shifted copy of the real signal. This complex signal can then be low-pass filtered. Figure 1 shows a portion a simulated impulse train which has been modulated and its envelope signal. The impulses repeat at a frequency of 75Hz and the modulation frequency is 10Hz. The envelope spectrum is formed by performing an FFT of the envelope time history. This is often used when the original signal has high noise content. In Figure 2 below we see the envelope spectrum from our modulated signal which clearly shows the 10Hz component relating to the rotational speed and then the impact frequency (75Hz) and its harmonics together with the side-bands. The side-bands are positioned +/-10Hz from each of the harmonics. 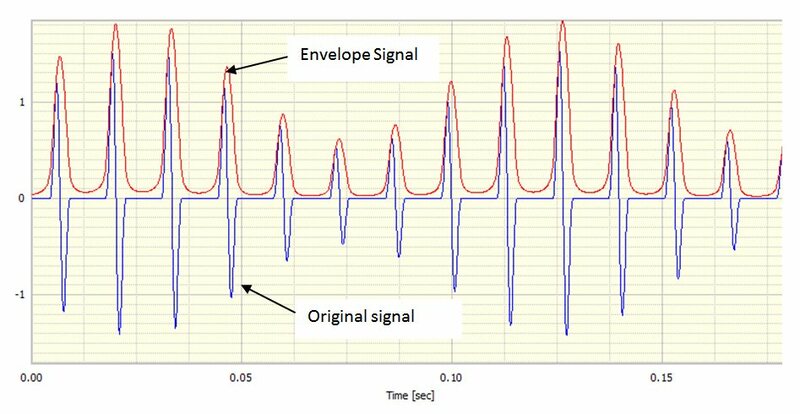 Another, flexible method for performing envelope analysis is called Complex Demodulation. 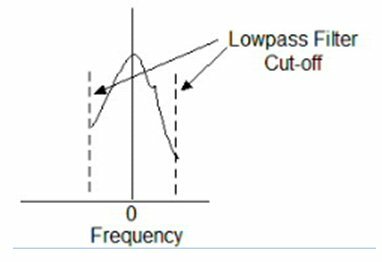 In this method a particular frequency or frequency band is chosen and then the frequency content of the signal is shifted such that this frequency becomes 0Hz or DC. The resultant signal is then low-pass filtered to produce the signal envelope. This is shown diagrammatically below. Now we low-pass filter the signal. The result shown in figure 5 is a narrow-band spectrum centred on a specific frequency which highlights the modulation components. The complex demodulation approach to envelope detection and subsequent envelope spectrum analysis can be most useful in high-noise situation. All bearings have resonant frequencies, usually at much higher frequencies than the defect frequencies we have looked at. However these resonances and its harmonics can be excited by the defect impulses. 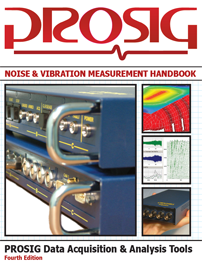 In this situation the vibration signature will consist of the resonant frequency modulated by the defect frequencies. Demodulating the signal around this resonant frequency allows the defect frequencies to be observed even in highly noisy signals. Assume our amplitude modulated signal now has a large quantity of noise added to it. The noise we added has a frequency bandwidth of 1KHz. We have also attempted to simulate a resonance at 5Khz by amplifying the modulated impulse signal in this frequency range. The time signature(Figure 6) shows that the noise dominates the signal and our defect impulses are no longer visible. The frequency spectra of this signal (Figure 7) shows how the noise dominates up to 1KHz. However there is some evidence of harmonics of the impulse signals at higher frequencies and a slight amplification at our resonance at 5KHz. If, we perform complex demodulation of the time history and request a centre frequency of 5KHz and a bandwidth of 500Hz and then form the envelope spectrum then the expected components and the side-bands again become visible as seen in Figure 8. Previously, in Part 1, we briefly looked at how we can use the detailed design information of bearings and gearboxes to look for specific fault conditions by collecting vibration information and analysing their frequency spectra. Now, we have examined techniques such as demodulation and envelope spectra analysis which are often used to more clearly reveal any defect frequency components embedded in a vibration signature. Don Davies graduated from the Institute of Sound and Vibration Research (ISVR) at Southampton University in 1979. Don specialises in the capture and analysis of vibration data from rotating machines such as power station turbine generators. He developed and is the Product Manager for PROTOR. Don is a member of the British Computer Society. First clear explanation of the different demodualion techniques that I have seen – thanks! Surely figure 5 should state ‘band pass filter cut-off’. Similarly, on part 2 when you talk about digital methods of demodulation, should than not also be a band pass filter rather than low pass? I’m working on a small project and I want to be able to demodulate TWF’s digitally. The most useful reading on my data collector is a 2.5-5 kHz ESP (demodulation) spectra. It would make more sense to me to use a 2.5-5 kHz band pass filter between squaring and square rooting the TWF prior to doing the FFT or have I got it all wrong?